Day 2 of the conference began early this morning and is just now ending and it’s after midnight. I do have a lot to tell you, but most of it going to have to wait a bit. Today’s big news is that David Mittelman with Family Tree DNA late this afternoon announced the Big Y DNA test which would be known as a ‘full Y sequence” test. The test will provide results on 10,000,000 base-pairs and approximately 25,000 SNPs on the Y chromosome. The regular price is $695, but it is being initially offered to current clients only for $495 though the end of November. A current vial can be used if one exists, otherwise a new one will be sent. Delivery will be in 10-12 weeks and it will be accompanied by comparison tools. Debbie Kennett compiled information from several folks who were tweeting and posting today and you can read more information at the link below. This entry was posted in Family Tree DNA, Y DNA and tagged Historical or Obsolete by Roberta Estes. Bookmark the permalink. $500 is a tidy sum. Is this test worth the money, from the genealogical perspective? When I get home, I will be writing about when and where this test is appropriate and will benefit someone. Thanks. I’m looking forward to it. For those of us who are looking to add a layer of information to their autosomal results, an update on the cost-effectiveness of the various Y DNA options would be very helpful. Good news but we need a bigger push for autosomal in my opinion – too many are already only interested in the Y & it doesn’t help those of us looking for fathers. Too many don’t understand autosomal testing even available, how it works or all the fascinating insights & history that will be theirs for the taking. If I had dollars for all the men who said ‘sorry only interested in direct male line’ I would be a rick woman. 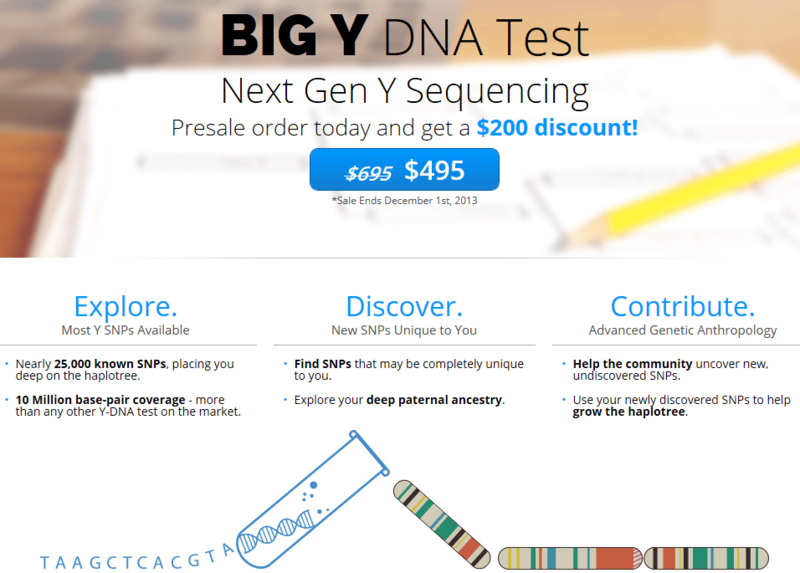 FGC: FullY (25M) + mtDNA + YSTRs (300) = $1250. Still more, but more than double STRs and SNPs for a relatively small jump in total price. – Few people jump in whole hog… They’re more likely to get *just* a low-level YDNA test at first. When that happens, you’re looking at $500 vs $1250, including some duplication. – It’s all about comparisons. I don’t know what you can get from FGC. OTOH, I have 71 FTDNA Y37 matches and only six have upgraded to Y111 (four match). What can one expect for the upgrade percentage for the “average user”? So, my gut feeling is that this is a tool when you have a group of known and suspected matches already, and not no much for when you want to find new matches. If that is the case, FGC would appear to have an edge. This is not a tool for beginners. This is an advanced tool. I’m still at the conference, in the room actually, and I will be blogging about when one might want to utilize this test and what it might do for you or a surname group. Interesting, but life is a matter of choices. For me I’d rather do test 5 family member with the Family Finder test. FGC’s mtDNA is not as accurate as FTDNA,and FTDNA can submit full mtDNA to Genbank. Meets my needs! I’m happy to explore what FamilyTreeDNA can find for me. FamilyTreeDNA’s turnaround and feedback has been superb thus far on this exciting journey of discovery. It’s been literally years, and I’ve only received one hit on Y37, Y67 and Y111, a seventh cousin once-removed who I already knew about through earlier testing with Ancestry.com. So I am not persuaded at all to spring for this Y10000000 [?]. Am I thinking correctly? Is there much improvement over the 67 marker Y Test, I did the mtDNA test and I haven’t found it to be much of a help.